I planted spring greens into every nook and cranny of my garden this season. and their colors, of course. then tucked everywhere there was bare soil. Romaine too, with chard and butter crunch in another. and kale and lettuces keeping company with the tulips and pansies. Not to mention the 'official' planting in Q3 of the potager. 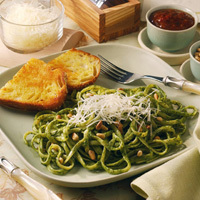 In a food processor add 1/3 cup toasted shelled pistachio nuts, 1 large bunch or 6 oz. bag spinach, 2 cups arugula and parsley, 4 coarsely chopped scallions and 2 or more cloves garlic. Blend one minute and while processor is running add 3/4 c. extra virgin olive oil until incorporated. Place in a bowl and top with 3/4 cup shredded Asagio cheese and salt and pepper to taste. Makes enough for two lbs. of pasta. he didn't think it was too shabby either.